On Tuesday, NBC announced that both Amy Poehler and Tina Fey will be hosting this year’s ceremony for the Golden Globes. Both are stars of NBC sitcoms (Poehler’s from Parks and Recreation, Fey’s from 30 Rock) and critically praised comedians. While I do love both comedians, I felt a little disappointed when I heard this. It isn’t because I think the awards ceremony won’t be funny, far from it actually. Parks and Rec is my favorite sitcom on TV currently and even though I don’t watch new episodes I still enjoy some of the old moments on 30 Rock. It’s that I’d like to see Ricky Gervais host again. I really don’t have any respect for the Golden Globes and Gervais will serves more as a roaster than a host, which is why I like seeing him there so much. 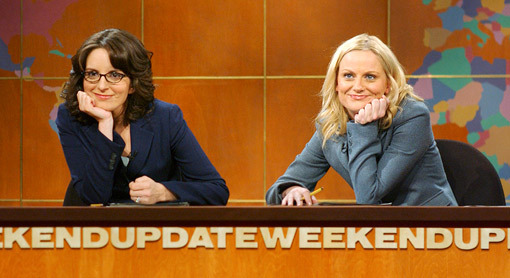 I’m guessing that both Poehler and Fey will be doing a traditional show, which won’t be bad. It will probably be really, really funny and seeing the state of awards shows these days, that’s exactly what we need. I love Gervais at the Globes too, but the Globes sure don’t like him for mocking them all the time. Picking Poehler and Fey I think is a smart idea since they’re probably more accessible for audiences. Still, I’m not sure if I’m going to watch the Globes this year since they usually ignore a lot of great films. Thanks for commenting.